The competition, named for Frederick Fennell, ASCAP member and past President of CBDNA, was established to encourage gifted American composers who create new works for concert band and includes a $5,000 prize. Written for saxophonist and Thornton alumnus Andrew Harrison (DMA ’15) and commissioned jointly by Mt. 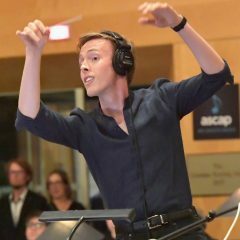 San Antonio College and the Pacific Symphony Youth Wind Ensemble (PSYWE), Pegram’s winning composition will be premiered by the PSYWE with conductor Gregory Xavier Whitmore at the Renée and Henry Segerstrom Concert Hall on March 10, 2019.